Magic Happens in the Majestic Santa Cruz Mountains. Extensive hardscape, roses, fruit trees, redwoods, and lush mature gardens are accented by a spectacular 40' terraced waterfall and koi pond. With over 2,000 sq. ft. of patio, porch, and decks on which to entertain, like royalty, overlook Love Creek Valley from your custom-crafted newly renovated 4BR/3BA hillside chateau high above. In all directions and from all rooms, like magic the serenity and splendor outside soothes and is felt inside. Willow Pond Ranch has 22+ acres with room to grow, 28+ horse stalls, indoor and outdoor arenas, spring-fed year-round creek, use permit plus much more. Nestled Alongside A Woodland Wonderland. Nature Abounds. Owls hoot, quail scamper, ducks dart, coyotes yip, hawks soar, bobcat hunt. 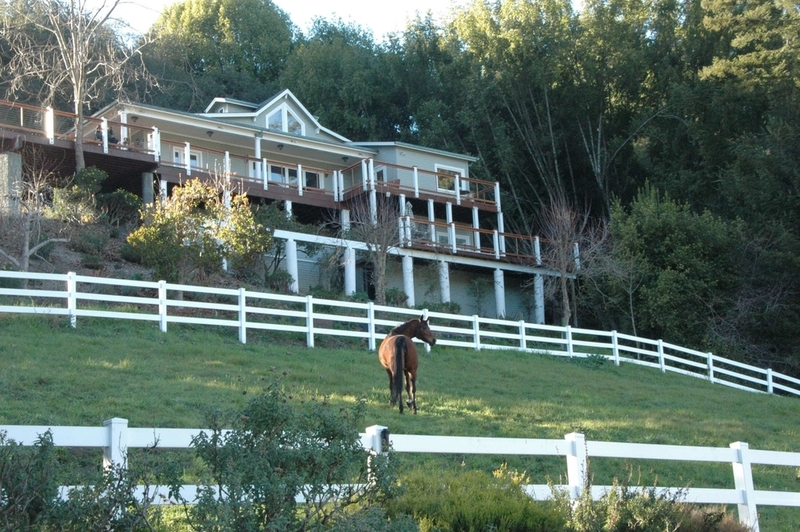 Enjoy the sanctuary seclusion, redwoods, valley views, extensive landscaping, ocean breezes, and quiet nights. for You and Your Horses. And, yet, only minutes to the fun of beaches, surf, shopping and dining, Central to Carmel, Silicon Valley, SJC, Monterey, Stanford, UCSC, Big Sur and Santa Cruz.